Coral reefs are vital ecosystems and they're disappearing. But you can help. Coral reef ecosystems help to benefit economies by providing protection against erosion, cultivating fisheries, creating and sustaining tourism activities, offering substances for medical uses, and providing a diversity of culture and aesthetics to communities. The 3 most basic things you should know. What does coral bleaching look like from years ago and now? Why do I need to only use reef safe sunscreen? Where can I find trusted brands of reef safe sunscreen? 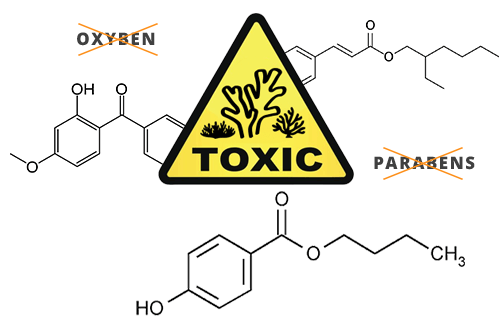 Oxybenzone, octinoxate, 4-methylbenzylidene camphor and butylparaben are all terribly harmful to coral reefs. The majority of sunscreens contain oxybenzone (also referred to as Benzophenone-3 or BP-3), which is incredibly toxic and is known to be one of the biggest factors of coral bleaching. What can I do to help protect reefs? Good management can save our reefs. The parrotfish are threatened because they are one of the favorite targets of local spear-fishermen. Most people understand that watersheds affect the reefs. There are groups of people, especially native people, on the island, who do Pono fishing. They know that it must be sustainable for the future. One good sized parrotfish makes over a ton of sand a year. So, you remove that individual from the reef and that’s one ton less of sand that you have. 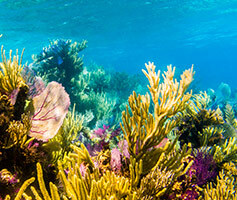 Healthy coral reefs are exceedingly important. Reefs support bustling diverse ecosystems that provide shelter to a fourth of all identified marine species and act as natural barriers, which protect the coastline from the ocean’s pounding waves. Additionally, coral reefs are known as medicine chests of the sea, with a number of its marine creatures producing compounds that have been used for human application, including treatments for cardiovascular diseases and leukemia! Coral reefs support numerous industries from food to medicine to tourism, and it is up to us to assist in their conservation and protection. Live sustainably! What does that mean? Well, it means reducing your carbon footprint in an effort to reverse the effects of global warming. 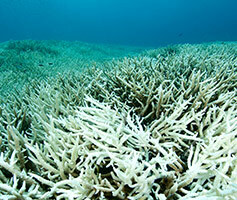 Extra heat from warmer temperatures puts stress on the coral, which leads to bleaching. Bleaching is the loss of color from tissue, causing it to expose its skeleton. 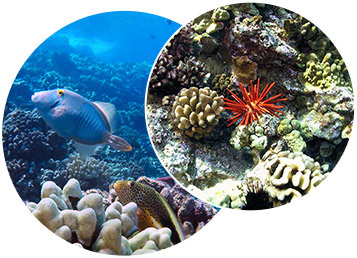 Did you know that eighty percent of the United States' coral reefs call Hawaii home? As such it is important to research coral-friendly businesses, from hotels to marine tour companies, to know what they are doing to help the environment. If you are planning on participating in a marine tour, don’t hesitate to ask what the company does to support ecotourism. Ecotourism is intended to create a positive experience that assists in building environmental and cultural awareness. Additionally, there are measures you can take to ensure that after your ocean adventure the only thing you leave behind is bubbles. Be responsible when you are participating in a marine tour—be sure that you are following local rules and regulations.